I came across a requirement to combine rows based on the values of a column. This is an interesting query so thought of sharing it with a simple example online. 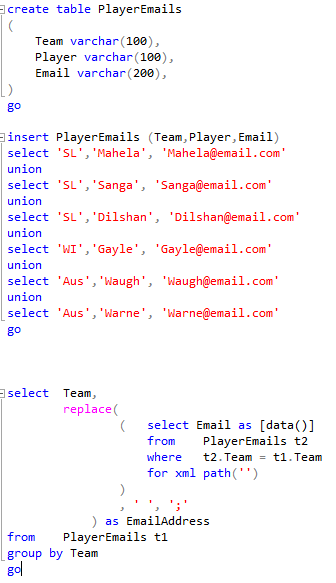 Here is a table with players from various teams and their email addresses. 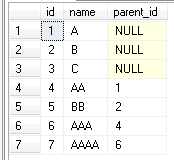 Here is the script to create the table, insert sample data and the query to select the mailing lists. SQL Server Error : The current transaction cannot be committed and cannot support operations that write to the log file. Roll back the transaction. Two of my colleagues had the following error recently and I helped them resolve it. So I thought of writing a blog on how to prevent this error with a simple example. Here is an example with maximum recursion set to 1000. 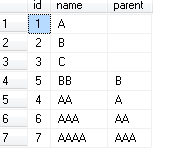 The query below print numbers from 1 to 100 using recursive CTE. This article explains cross apply and outer apply. My first introduction to the APPLY operator was using the DMVs. For quite a while after first being introduced, I didn’t understand it or see a use for it. While it is undeniable that it is has some required uses when dealing with table valued functions, it’s other uses evaded me for a while. Luckily, I started seeing some code that used it outside of table valued functions. It finally struck me that it could be used as a replacement for correlated sub queries and derived tables. That’s what we’ll discuss today. I never liked correlated subqueries because it always seemed like adding full blown queries in the select list was confusing and improper. What made this ugly was the need to use the GROUP BY clause because we could not correlate. Also, even though SQL almost always generates the same execution plan as a correlated sub query, there were times when the logic inside the derived table got so complex, that it would not limit the result set of the derived table by inferring the correlation first. This made this kind of query sometimes impractical. As for the execution plans, in my experience CROSS APPLY has always won. Not always by a lot, but it still wins. So what is OUTER APPLY? It’s equivalent to a left join on the derived table.